In recent years, Turtle Beach has become a powerhouse in gaming audio, gaining a reputation as one of the premiere proprietors of sound equipment for both console and PC gaming. While it’s become known in part for the steep price tag that many of the top-notch sets go for – some of the company’s pricier offerings can reach into the hundreds of dollars. The Turtle Beach Ear Force Z22 sits near the lower end of that spectrum, but doest it offer the same level of quality gaming enthusiasts have come to expect from Turtle Beach? In a word, yes. The Ear Force Z22 upholds Turtle Beach’s reputation for solid high-end audio equipment. Wearing the Z22 more or less makes you dead to the outside the world; finding myself in a particularly difficult level of Psychonauts or an especially frustrating round of Team Fortress 2, I’d let loose a string of expletives – anger management issues, kids – only to discover I could barely hear myself speak. When you’re plugged in, you’re totally immersed in whatever it is you happen to be listening to; the sound quality is practically unmatched. That’s not something you’re going to find with your run-of-the-mill headset. Comfort is obviously a huge consideration when it comes to a quality headset – nobody wants to deal with an uncomfortable rig during a marathon Battlefield session or a long movie or TV binge – and the Z22 doesn’t disappoint. It’s not a small piece of equipment by any means, but this is a piece that’s designed for comfort first and foremost. Getting going with the Z22 is easy – once you pop it out of the box, it’s good to go. There’s no lengthy set-up process; the only complicating factor is the inclusion of the optional inline amplifier, but even that is a matter of routing the headset through a USB amplification device. Your mileage may vary on the usefulness of the inline amplifier, but it’s essential if you’re going to use the Z22 for multiplayer gaming or any kind of sound-based multitasking (Skyping and listening to music, for example). The amplifier allows you to adjust various sound levels – your voice output, game/music volume and incoming voice volume. This allows you to, say, turn down ambient noise and music from your latest Call of Duty match so you can better hear teammates or fellow players. (You can also adjust bass and treble.) It’s fairly simple to utilize and works magnificently, giving you more or less total control over how you filter sound through the Z22. The amplifier even comes equipped with a belt clip for the times you need to adjust sound through your mobile device. Speaking of mobile, it’s a mixed bag. The Ear Force Z22 also works with smartphones and tablets, which allows you to bring that quality sound with you on the go. Watching Dawson’s Creek at the gym? Cat videos on your morning train ride? The Z22’s got you covered; just plug in and you’re ready to bring that sound immersion out into the world. No random gym goer is going to stop you from hearing every last explosion and wry qup in Avengers, dagnabbit! 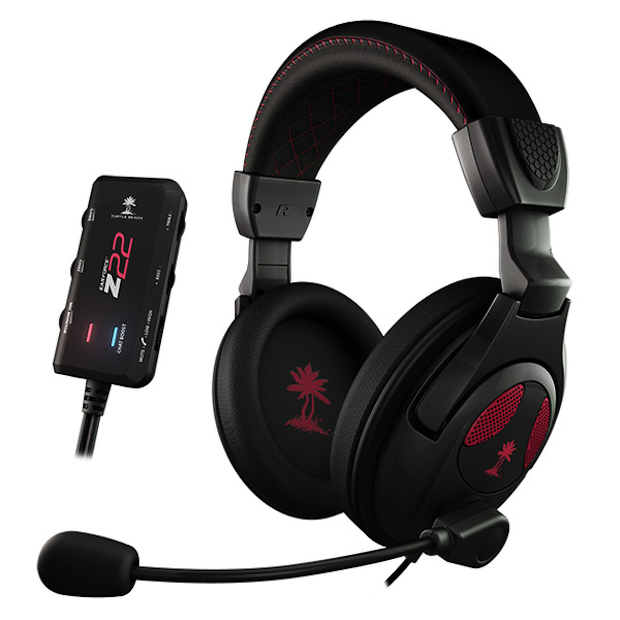 Ultimately, it’s hard to go wrong with Turtle Beach in general, and the Ear Force Z22 upholds that pedigree. It may not have the more complex features of some of the company’s more expensive offerings, but the sound quality’s the same, but if you’re coming off of Xbox Live headsets and iPhone earbuds, it’s basically a godsend. If you’re looking to upgrade your gaming audio equipment for a relatively low cost, you could do much, much worse than the Z22. Just be warned – you’re going to look like a dork if you take it on the bus.